At the time of writing, OpenGL 4.2 is the most recent revision of the specification. Prior to 3.0, the specifications were backwards compatible with each version having strictly more features than the last. As stated previously, the programming models supported by the early revisions of OpenGL do not reflect how modern graphics hardware works at all. Starting with 3.0, all methods of vertex specification other than vertex buffer objects have been deprecated/removed. With all modern graphics hardware now supporting a fully programmable pipeline, the concept of a "vertex buffer" has essentially been generalized to a "vertex attribute buffer". In other words, programs no longer use functions such as glVertexPointer() to mark sections of an array as containing "vertex position data", or glColorPointer() to mark sections of an array as "colour data". Indeed, these functions are also deprecated and do not exist in versions of OpenGL beyond 3.0. 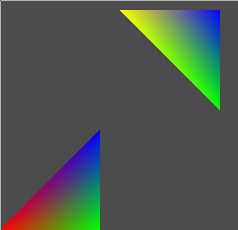 OpenGL essentially no longer has any concept of "the colour of a vertex" or "the position of the vertex"! Now, of course, the previous statement seems nonsensical. How would it be possible to produce 3D graphics in a system that could not understand "the position of a vertex"? Essentially, OpenGL now leaves the interpretation of buffered data up to programs written by the programmer that execute directly on the GPU. The programs are written in GLSL ("GL Shading Language") and a full tutorial is out of the scope of this document. In other words, where "vertex" and "colour" data (etc.) served as input for a fixed-function rendering pipeline, data is now treated generically and serves as input to a programmable rendering pipeline. The preceding program uses custom vertex and fragment shaders. The vertex shader defines two attributes, named position_data and colour_data, respectively. The program uses glVertexAttribPointer to specify that position_data takes input from the buffered vertex data in the same manner that glVertexPointer did in the previous programs. It also uses glVertexAttribPointer to specify that colour_data takes input from the buffered vertex data in the same manner that glColorPointer did in the previous programs. As stated before, the interpretation of the data is left up to the writer of the shading program that runs on the GPU. In the vertex and fragment shaders above, the position data is multiplied by the modelview and projection matrices and the colour data is interpolated and used in the fragment shader. The precise details of these programs are better described by any of the GLSL tutorials (or the official GLSL book).